Paul Klee is one of The Other Half’s all time favourite artists. We were determined to go to the EY Exhibition: Paul Klee – Making Visible at Tate Modern this weekend. The plan was to go after work on Friday evening. That’s what we’d done for the Mira Schendel exhibition last month, and that had worked well. But when it came to it, I wasn’t up to it. We contemplated going on Saturday morning instead, but guessed that it would be busy or busier than I’d like. And then, checking the website, I noticed that they have late nights on Saturday nights too. Well, that worked. That worked well. It was even less busy than during the Mira Schendel visit. And that’s worth remembering. There are 17 rooms to see. Let me start with this, because it will wear you out. I sat down for a bit in Room 10, mulling over what I had seen so far. A woman seating next to me asked her partner how many more rooms they had left to do. I laughed out loud. We exchanged an amused glance. At times like this, I wish I had a Tate card, so I could come back a few times. Well, that’s what I was thinking at the time. Now, I’m glad I saw it all in one go, because the exhibition is an entity. I don’t think you can do a couple of rooms one day, and a few more rooms another day. You would lose the intensity of the story you’re told. You would struggle to see Klee as the genius that he was. You would lose the sense of wonderment when you look around, yes… all these works are from one man. I had preconceived ideas. Well, for one, I didn’t know that he was such a varied artist, and so prolific. He was shy but that wouldn’t deter me from having him on my list of people to have over for a dinner party. The man comes across as humorous, contemplative, creative, precise and deeply cultured. And mindful. “[…] he falls in love with a green leaf, a star, a butterfly’s wing“, Hugo Ball, Flight out of Time, March 1917. There’s a lovely description of Klee as being ‘full of inner watching‘. “Then he would rise and quietly, with unnerving sureness, he would add a touch of colour here, draw a line or spread a tone there”, Lyonel and Julia Feininger, ‘Recollections of Paul Klee’, 1945. I got the feeling that his mind was constantly at work, busy thinking and creating. Each of the 17 rooms is themed and covers a specific time in Klee’s life. His latest invention or painting method. Klee created his own tracing system (a new ‘oil-transfer’ method) and abstract pointillism (a complex layering of marks and lines). He used paint brushes through sieves. Factory Town, 1933 (from here). Such a different take from Lowry. My absolute favourite? Architecture (1923). It struck a chord with me. The diversity, the inventiveness, the creativity and the colours. “Colour possesses me. I don’t have to pursue it. It will possess me always, I know it. That is the meaning of this happy hour: colour and I are one. I am a painter” (Paul Klee Diaries, April 1914). 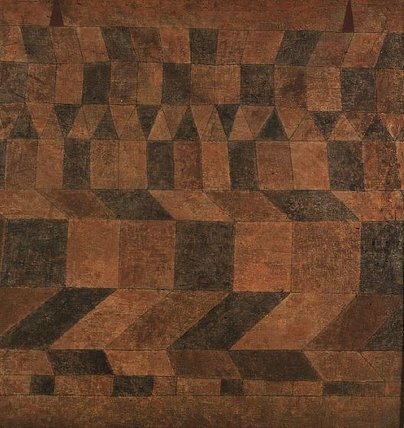 This entry was posted in Art & Exhibitions and tagged Art, London, Paul Klee, Tate Modern. Bookmark the permalink.